Crawford is no lightweight thinker. This book has challenged how I think about communication and distraction more than any other book that has come before it, and I’ve read at least 9 books in the last year on this topic alone. Although there are several areas where the author and I disagree, the framework for the discussion is important and timely. 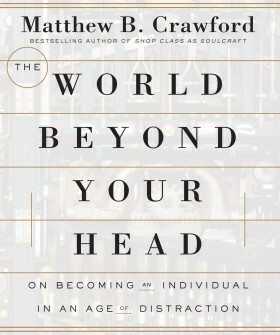 With implications for educational institutions and governments on how we think about labor and individual fulfillment, Crawford has created a work of serious thought and thorough research that should not be ignored. If you haven’t had the discussion with your family about how one’s attention and focus might be controlled and protected from the constant distraction and perceived liberty offered via instant communication, it might be the most meaningful conversation you have all year.